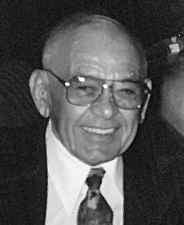 After a lengthy illness, Theodore (Ted) Okrainec, aged 75 years, passed away April 11, 1997 at the Health Sciences Centre with his family at his side. Ted was predeceased by his parents, William and Katherine; his brothers, Jerry and Edward; and sister Bernice MacRae. He will be sadly missed and forever remembered by his loving wife, Bertha, of 48 years; his son, Roger (Debbie); his daughter, Norma Tombs; his grandchildren, Ryan and Brent Tombs and Jeffrey and Jillian Okrainec; along with many aunts, uncles, cousins, in-laws, nieces, nephews and friends. He is also survived by brothers, Joseph and Ernie (Anne) of Lac du Bonnet, MB, Adam (Kay) of Kamloops, B.C; his sisters, Edith (Mike) Klowak of Winnipeg, MB, Irene Chapelle of Los Angeles, California and Elsie and Ted MacRae of Los Angeles, California. Ted joined the armed forces in January 1943. He joined active service with the Little Black Devils and went overseas, landing in Scotland. After spending one year there, he went on to Germany and France. While there, the war ended and Ted spent an additional year in Germany in occupational service, returning home to Canada and Lac du Bonnet on June 26, 1946. Ted was employed for a period of time with the Manitoba Hydro in Pine Falls, McArthur Falls and then Ontario Hydro. He returned to his home of Lac du Bonnet, where he worked as a plumber in Pinawa and the surrounding area, retiring in 1982, due to ill health. Ted was a life member of the Lac du Bonnet Royal Canadian Legion Branch #164. On his retirement, he and his wife, Bertha, were fortunate in enjoying many years of travel, spending their winters in Hawaii, Florida and Texas. Ted will always be remembered for his humour, quick wit and love for life. This was particularly evident in his positive attitude in coping with his illness and his decision to donate his body to the Faculty of Medicine in support of medical studies. The family would like to extend their sincere thanks to all the health care staff who so generously gave of their skills to Ted. They especially would like to acknowledge Dr. Don Allan, Dr. Laverne Janzen, the staff at Health Sciences Centre A6 Kidney Dialysis Unit and Ted’s special nurse, Karen. A memorial service will be held at 2:00 p.m. on Friday, April 18, at St. Ignatius Church, 255 Stafford Street, (corner of Corydon and Stafford) Fr. Eric Jensen officiating. Honourary pallbearers are from the Royal Canadian Legion Branch #164 of Lac du Bonnet. In lieu of flowers, donations may be made in Ted’s memory to the Canadian Kidney Foundation of Canada, Manitoba Branch, 200-55 Donald Street, in memory of Ted.